We would love to hear from anyone who is a cultural practitioner, community organization representative, expert gardener, or just passionate about sustainable gardening/rain gardens. Contact Nicole at nkhori@gmail.com. Let’s connect people who want to be growers (e.g., condo-dwellers) with people who have garden space. Garden sharing will help grow more food in urban areas, and allow people to learn from kupuna who may not have the energy to take care of their own gardens anymore. Since every hui is different, each will need to set clear expectations and goals, and we will support people through this setup process. In some cases, there could be multiple “Growers” who team up to work in a single yard, or a grower who works in multiple yards could grow a variety of things as a source of income. Since water usage is one source of conflict (because there could be high water bills), we would like to provide rain barrels to our garden teams and encourage them to create rain-fed gardens as much as possible. We would also like to match the teams with mentors and other resources as needed to help them be successful. Open space: Grower installs beds of lettuce, beans, and kale in areas where there used to be lawn/unused land. Mango Tree: Grower provides money for professional tree trimming, picks fruit for next 2-3 years. Open space: Grower plants trays of small pots with ornamental plants, and then takes them to sell when they’re big enough. Junk: “Grower” helps to clear out junk for bulky pickup and gets to take home flowers/fruit from existing trees. Urban Farmer: Grower has partnerships with a bunch of homeowners to grow crops for sale at a farmer’s market. 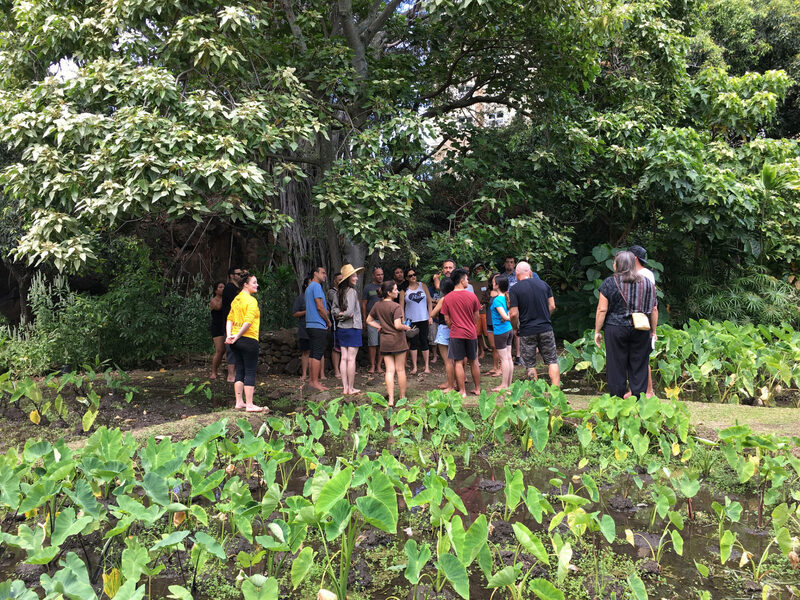 GardenHui: A team of friends work together, caring for the yard of one kupuna.